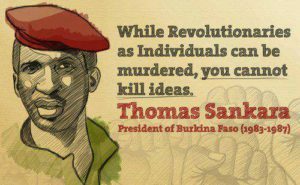 Unarguably one of the most incredible persons to tread the face of this earth, Thomas Sankara was gunned down on October 15, 1987 aged 37. To date, the former president of Burkinafaso remains one of the most inspirational figures on the African continent. But just who is Sankara? Daniel Kazungu brings you the incredible story of a giant of a man who many refer to as Africa’s Che Guevara. In one of the most high-profile killings in Africa’s post-independence history, armed men on October 15, 1987, burst into the office of Thomas Sankara, murdered him and twelve of his aides in a violent coup d’état, that came just a year after he visited Uganda. Regarded by many as Africa’s Che Guevara, Sankara’s memory remains fresh in the minds of many Africans 30 years after his gruesome death. In events parallel to those in the Congo when European intelligence agencies and their Congolese surrogates murdered Patrice Lumumba, a budding Congolese politician, the attackers mutilated Sankara’s body and buried him like a pauper in a hastily prepared grave in the dead of the night. The next day, Blaise Compaoré, who was Sankara’s deputy, declared himself president and went on to rule the country until 2014, when he was forced to flee the country amidst a popular uprising. Between 1987 and 2014, Compaoré both attempted to co-opt and distort Sankara’s memory and making promises to bring his murderers to justice. Nothing ever came of that. Born on December 21, 1949 to to Joseph and Marguerite Sankara, Sankara’s Roman Catholic parents wanted him to be a priest but he opted for a military career instead. In 1970, at the age of 20, Sankara was sent for officer training in Madagascar, where he witnessed a popular uprising of students and workers that succeeded in toppling Madagascar’s government. Before returning to Upper Volta in 1972, Sankara attended a parachute academy in France, where he was further exposed to left-wing political ideologies. In 1974, he earned much public attention for his heroic performance in the border war with Mali, but years later he would renounce the war as useless and unjust. By the early 1980s, Burkina Faso was being rocked by a series of labour union strikes and military coups. Sankara’s military achievements and charismatic leadership style made him a popular choice for political appointments, but his personal and political integrity put him at odds with the leadership of the successive military governments that came to power, leading to his arrest on several occasions. In January 1983, Sankara was appointed prime minister of the newly formed Council for the Salvation of the People (Conseil de Salut du Peuple; CSP), headed by Jean-Baptiste Ouédraogo. The trained pilot and captain in the Upper Volta Airforce was a very popular figure in the capital of Ouagadougou. Sankara was also an excellent guitarist and rode motorbikes on streets which endeared him to the common people, making his star shoot up further. But Sankara’s anti-imperialist stance and grassroots popularity increasingly put him at odds with conservative elements within the CSP, including President Ouédraogo. Sankara was fired as prime minister in May and arrested once again. On August 4, 1983, Blaise Compaoré, Sankara’s close friend and fellow army colleague, led a group that freed Sankara, overthrew the Ouédraogo regime, and installed Sankara president at the age of 33, marking the beginning of the buoyant four years that the Burkinabe look back at with nostalgia. Thomas Sankara’sideas were not only strong ideologically but were also realistic. File photo. Throughout this life and even beyond the grave, Sankara remains an inspiration to young Africans and people committed to a radical pan-Africanist future. What he did in just four years in office sounds like a scene in a Hollywood movie and is a stark contrast to many African leaders who reign for decades but with nothing to show other than corruption and propaganda. Burkina Faso (known as Upper Volta until 1984) didn’t attract much attention outside West Africa until Sankara overthrew the country’s corrupt military leadership in 1983. Like Lumumba, an earlier principled political leader who was a violent casualty of the Cold War, Sankara proved to be a creative and unconventional politician who achieved unbelievable feats for his hitherto unknown West African country. He also successfully implemented programmes that vastly reduced infant mortality, increased literacy rates and school attendance, and boosted the number of women holding governmental posts. On the environmental front, in the first year of his presidency alone 10 million trees were planted in an effort to combat desertification. On the first anniversary of the coup that had brought him to power, he changed the country’s name from Upper Volta to Burkina Faso, which means roughly “land of upright people” in Mossi and Dyula, the country’s two most widely spoken indigenous languages. 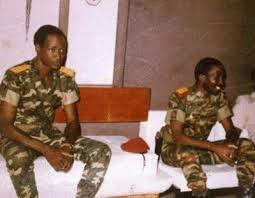 Thomas Sankara (right) was reportedly assassinated by his friend Blaise Compaore (left). File photo. Sankara’s government made female circumcision illegal, condemned polygamy, and promoted contraception. These were radical programmes ahead of his time. Sankara preached economic self-reliance. He shunned World Bank loans and promoted local food and textile production. When Sankara was president, Burkina Faso woke up in four years from a hunger-stricken net importer of food, to a self-sustaining breadbasket. His revolution was realised first and foremost from the plates and stomachs of the citizens. He outlawed tribute payments and obligatory labour to village chiefs, abolished rural poll taxes, instituted a massive immunization programme, built railways and kick-started public housing construction. His administration aggressively pushed literacy programmes, tackled river blindness and embarked on an anti-corruption drive in the civil service. Women, the poor and the country’s peasantry benefited mostly from these reforms. His administration promoted gender equality in a very male-dominated society, including outlawing female circumcision and polygamy. He discouraged the luxuries that came with government office and encouraged others to do the same. He earned a small salary of $450 monthly (about Shs1.6 million ), refused to have his picture displayed in public buildings, and forbade the uses of chauffeur-driven Mercedes and first class airline tickets by his ministers and senior civil servants. This is a stark contrast to majority of African countries where the political elite and civil servants lead a privileged lifestyle. His reputation for incorruptibility in a poor continent of fabulously rich presidents, make him a darling for today’s idealists. He told civil servants to donate a month’s wage every year into a state fund, and sold off all extravagant official vehicles. In their places, the Renault 5, the cheapest car sold in Burkina Faso at the time, was made the official vehicle for all civil servants and government personnel, including the president himself. Here was such an incorruptible leader that at the time of his death, Sankara’s assets were a brick house, a bank account with $400 (Shs1m) in cash, three guitars, four bikes, a fridge and a spoilt freezer. Sankara also confiscated land from traditional institutions, including chiefs, who owned hordes of arable land and real estates, and gave it to the working peasants. He went ahead to construct government housing estates in the cities and declared the year 1985 rent free. He refused to have his picture displayed in public buildings, which is still uncommon as of today. But his regime was not immune to undemocratic practices. Sankara banned trade unions and political parties and put down protests, most notably one by teachers in 1986. Many people were the victims of summary judgments by people’s revolutionary tribunals, which Sankara himself would later admit were often used as occasions to settle private scores. The revolution did not please everyone, including superpowers such as France who saw him as a rebellious leader in the former colony. The elite political class was not happy either, that the youthful president was bulldozing them into stepping out of their privileged lifestyles. Thomas Sankara was an upright politician and soldier whoendeared himself to many. Compaoré is widely suspected to have ordered Sankara’s murder in order to do the French and regional dictators a favour. Though Compaoré pretended to publicly grieve for Sankara and promised to preserve his legacy, he quickly set about purging Sankara’s supporters. In contrast to the cool reception given to Sankara earlier, Compaoré was welcomed by Western governments and funding agencies. Within three years, Compaoré had accepted a massive IMF loan and instituted a structural adjustment programme, largely seen as one of the major causes for the ongoing economic crises in Africa. Compaoré also reversed most of Sankara’s reforms. Not surprisingly this included the insistence that his portrait hang in all public places as well as buying himself a presidential jet. “There is no detectable DNA in accordance with the current state of science,” said Benewende Stanislas Sankara, one of the lawyers representing Sankara’s family and who is no relation. Be it through the red beret, worn by firebrand South African politician Julius Malema, or the household brooms being wielded at street demonstrations in Burkina Faso, there are signs that his legacy is enjoying a revival. But he is seen by others as an autocrat who came to power through a coup and valued discipline above human rights. Sankara was a staunch defender of all things home-grown – such as cotton – and yet the African textile industry failed to make him a T-shirt icon. While Burkina Faso’s former leader may not be the poster boy of revolution, like Argentine-born Che Guevara, many taxis across West Africa have a round sticker of him in his beret on their windscreens. Sankara’s spirit is also behind a protest movement that led to the overthrow of Blaise Compaore about three years ago. Sankara also organised weekly street-cleaning sessions which have since been adopted by many countries eg Rwanda’s Umuganda. “Sankara’s spirit still floats over Burkina Faso,” says the Sankarist politician, who is also the lawyer for the late president’s family. “He was ahead of his time. The values people agree on today – the need for good governance and reducing consumption – were what Sankara taught us,” says the lawyer. But in neighbouring Ghana – whose former President Jerry Rawlings was a firm friend of Sankara – post-graduate law student David Guat, 50, sounds a note of caution when he talks to younger students. Sankara seized power not long after Flight Lieutenant Rawlings had led his second coup. “Sankara copied a lot of Rawlings’ ideas. The two men were firm friends – to the extent that they wanted to merge their two countries. Still, without achieving Che Guevara’s fame, Sankara’s legacy has spread far and wide. He is a spirit that inspired protesters who burnt the parliament and other government buildings after Compaore tried to manipulate the constitution to extend his years in power. But in trying to show that he was his own man, Sankara found himself in sharp conflict with France which wanted puppets in former colonies for presidents in French speaking Africa. He consequently became a marked man for his closeness with the Soviet Union and Cuba, the countries that were on the opposite axis with Western powers. The captain despised development aid, telling both his countrymen and African presidents at the Organisation of African Unity (OAU) that aid was leading to neo-colonialism and dependence. In 1987 under the auspices of the OAU, Sankara tried to convince his peers to turn their backs on the debt owed to Western nations. “Debt is a cleverly managed re-conquest of Africa. It is a re-conquest that turns each one of us into a financial slave,” he argued. Sankara didn’t drink wine and preach water. The four year revolution in Burkina Faso turned around the economy, created a local industrial base, compelled public servants to wear locally made clothes during office hours and established economic zones in a bid to improve the infrastructure of the country. School attendance also improved from as low as 12 per cent to a modest 22 per cent. Sankara’s belief in self-sustenance had him announce, “he who feeds you, controls you.” Under two years, production of wheat went from 1,700kg per hectare to 3,800kg, launching Burkina Faso into food self-sufficiency. Critics say Sankara and his supporters did not succeed in getting the population to internalise the ideals of the revolution. “He didn’t understand that you cannot force a revolution on a population. You have to educate the population politically before you can start a revolution,” said a critic. But John Jerry Rawlings, the former president of Ghana and friend of Sankara, told interviewers that “Sankara was an impatient man”. But he defended him thus, with poverty and suffering in Burkina Faso of his time, there was no time for patience. Sankara was adored in the leftist circles for bashing imperialists. He was a hero of the pan-African movement. Foretelling his death, Sankara said, “While revolutionaries as individuals can be murdered, you cannot kill ideas.” He was spot on. Supporters of Thomas Sankara gather at his grave on the 20th anniversary of his death in 2007. File photo. While Compaoré was still in office, a court blocked a request by Sankara’s family for an exhumation. But the new government, headed by Michel Kafando, has announced that the long-awaited investigation can finally go ahead. Sankara is still much revered across Africa today. But a deeper, more troubling mystery still remains: whether Sankara’s revolution would have sustained itself had he lived on or whether, like so many others, it would have turned and consumed him. Would he have clinged on to power and metamorphosed into a dictator like many of his contemporaries? Only God knows but what is true is that Capt Thomas Noel Isidore Sankara was a president like no other. It is difficult to comprehend why visionary people like the late Thomas Sankara are out of the scene during their prime, not by natural cause but by the wicked hands of man. In Sankara, Africa lost a giant of a man. A man who reflected the yearnings and aspirations of multitudes of young Africans. A man who exemplified the life of personal sacrifice needed from African leaders in order to pull the continent out of the current abyss. Unfortunately, he was cut down in his prime. Like a demented hen, Africa has been sucking its finest eggs for too long. A permanent inductee into the African Wall of Fame, Thomas Sankara showed the world how military rule can sometimes be better than democratic government. Andrew Mugoola, a resident of Jinja who was around when the revolutionary icon visted Owen Falls Dam in Jinja, Uganda before it was changed to a local name, remembers the noble soldier questioning why such an iconic place was named after a white man. To Mugoola, Sankara is a man who comes once in a thousand years.